Knee joint loading has long been linked to knee OA.10 The medial and lateral compartments of the knee are unevenly loaded during walking gait, with the medial compartment typically absorbing much higher loads than the lateral compartment. This uneven loading phenomenon may at least partially explain why OA is roughly 10 times more likely to affect the medial compartment than the lateral compartment.11 Medial compartment knee OA leads to articular cartilage loss relative to the healthy cartilage of the lateral compartment (Figure 2), as well as sclerosis and the formation of osteophytes. This can create pain, discomfort, and, eventually, immobility for individuals with the disease. It is possible to reduce KAM by reducing the magnitude of the ground reaction force vector. This is why doctors often recommend that individuals with knee osteoarthritis lose weight. It may also be possible to reduce force magnitude for individuals who walk with abrupt and choppy movements by training them to walk more softly, though this is likely to have a minimal effect. 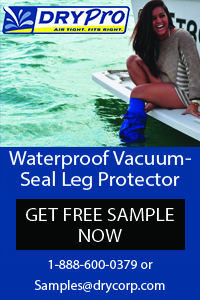 What can be more effective is to walk in a way that reduces the lever arm between the ground reaction force vector’s line of action and the knee joint center. This manner of reducing KAM could be particularly beneficial for individuals with early stage medial compartment knee osteoarthritis as it shifts loading away from the diseased medial compartment to the healthy lateral compartment of the knee. Research has shown that several gait modifications reduce KAM in healthy people and in individuals with knee osteoarthritis.8 Some effective gait modifications include toe-in gait, toe-out gait, increased trunk sway, and knee medialization. These modifications are detailed below. These studies were performed for a variety of baseline foot progression angles, so even when participants’ normal gait involved toes that were already pointed straight ahead or slightly inward, training additional internal foot rotation provided the same benefits of reduced medial compartment loading as subjects with more externally rotated foot progression angles. Figure 2: Standing knee x-ray for an individual with medial compartment knee osteoarthritis. 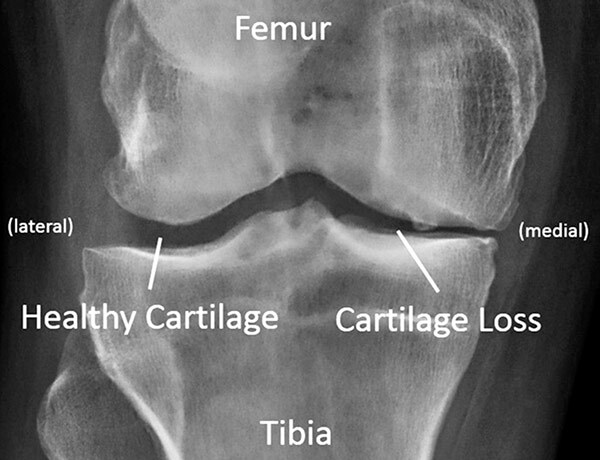 The loss of articular cartilage is evident in the narrower gap in the medial compartment. Toe-out gait. Toe-out gait occurs as the foot externally rotates, causing the toes to point more outward compared with a typical foot progression angle. There is a linear relationship between the degree of toeing out and the magnitude of the second peak of the KAM in individuals with knee osteoarthritis, as a greater degree of toe-out is associated with a lower second peak knee adduction moment.20 Additionally, individuals with knee osteoarthritis who learn to toe-out compared with their baseline foot progression angle directly lower the second peak knee adduction moment.21,22 However, toe-out gait can increase the first peak knee adduction moment.18 Though toe-out gait reduces the second peak of the knee adduction moment, it is the first peak that has been linked to the presence,13 severity,14 and progression15 of medial compartment knee osteoarthritis and thus may be the more critical peak to lower. Increased trunk sway. Walking with increased trunk sway shifts weight from the upper body laterally towards the knee joint center during the stance phase of gait. The ground reaction force follows the shifting weight and moves the line of action closer to the knee joint center. This results in a shortened lever arm and a reduced knee adduction moment. In this study, 10 individuals with early stage medial compartment knee osteoarthritis and self-reported knee pain performed weekly gait retraining sessions for six weeks. Wearable haptic (touch) devices were used to provide real-time biofeedback17,30 to train subjects to internally rotate their feet (i.e., adopt a toe-in gait)19 to reduce the knee adduction moment. Haptic feedback was given with a single vibration motor attached to the lower leg. A 500-ms vibration pulse on the leg was given during stance to indicate when that toes should be pointed more inwardly, and no vibration indicated that no correction was needed. 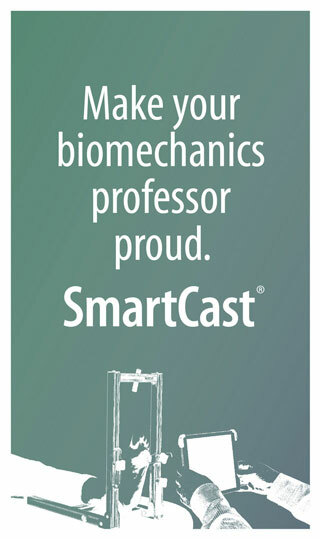 During each step, kinematics were computed in real-time during the first half of stance and the vibration motor automatically vibrated during the last half of stance when the foot was not internally rotated. Subjects readily understood and quickly adapted to this type of haptic feedback gait training. Participants performed weekly training sessions to reinforce the new walking pattern and were encouraged to practice on their own at home or at work throughout the week. The standardized Western Ontario and McMaster Universities Osteoarthritis Index (WOMAC) questionnaire and a 10-point visual analog pain scale score were measured at baseline, at the end of six weeks of training, and one month after training ended to assess changes in knee pain and knee function. The results of the study showed that, on average for all participants, gait retraining reduced the first peak of the KAM by 20% as a result of a 7° internal foot rotation (i.e., toe-in gait). 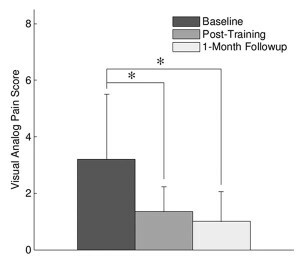 WOMAC pain scores improved by 29% post-training, and WOMAC function improved by 32%. The visual analog pain scale score improved by two points (Figure 3). Although there wasn’t a specific placebo control group, as with all osteoarthritis interventions, there was an expected placebo effect.31 However, changes in WOMAC pain and function were approximately 75% larger than the expected placebo effect, which suggests that the improvements were due at least in part to the reduced mechanical loading on the medial compartment of the knee. Changes in the knee adduction moment, foot progression angle, WOMAC pain and function scores, and visual analog pain score were retained at the follow-up session, one month after the end of the six-week training. The results of this study are promising and show that gait retraining programs for individuals with medial compartment knee osteoarthritis can alleviate knee pain and improve knee function. To make gait retraining a viable treatment option for individuals with medial compartment knee osteoarthritis, longitudinal testing must be performed. 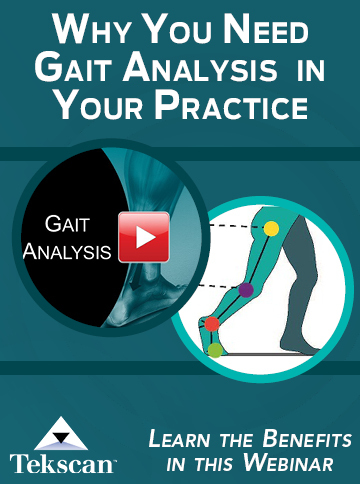 The primary question is: does gait retraining ultimately slow knee osteoarthritis progression? While initial research has been promising in demonstrating that altered gait patterns can not only reduce knee loading but also reduce knee pain and improve function, the long-term outcome of adopting a new walking pattern is unclear. Studies examining six-month, one-year, five-year, and 10-year outcomes of gait retraining would provide deeper insights. Of particular importance is whether gait retraining slows the radiographic progression of knee osteoarthritis compared with no intervention. Also, does pain continue to lessen over time by walking with a new gait pattern or does it revert to pretesting levels? There is much evidence to suggest a positive long-term outcome, but only time and future research will tell. It is exciting to consider that an act as simple as changing the way one walks could have a profound impact on such a prevalent and debilitating disease. Pete B. Shull, PhD, is an assistant professor at the State Key Laboratory of Mechanical System and Vibration, School of Mechanical Engineering, Shanghai Jiao Tong University, in Shanghai, China. Lawrence RC, Felson DT, Helmick CG, et al. Estimates of the prevalence of arthritis and other rheumatic conditions in the United States. Part II. Arthritis Rheum 2008;58(1):26-35. Dillon CF, Rasch EK, Gu Q, Hirsch R. Prevalence of knee osteoarthritis in the United States: arthritis data from the Third National Health and Nutrition Examination Survey 1991-94. J Rheumatol 2006;33(11):2271-2279. Gabriel SE, Crowson CS, Campion ME, O’Fallon WM. Direct medical costs unique to people with arthritis. J Rheumatol 1997;24(4):719-725. Maetzel A, Li LC, Pencharz J, et al. The economic burden associated with osteoarthritis, rheumatoid arthritis, and hypertension: a comparative study. Ann Rheum Dis 2004;63(4):395-401. Yelin E, Murphy L, Cisternas MG, et al. Medical care expenditures and earnings losses among persons with arthritis and other rheumatic conditions in 2003, and comparisons with 1997. Arthritis Rheum 2007;56(5):1397-1407. Sarzi-Puttini P, Cimmino MA, Scarpa R, et al. Osteoarthritis: an overview of the disease and its treatment strategies. Semin Arthritis Rheum 2005;35(1 Suppl 1):1-10. Simic M, Hinman RS, Wrigley TV, et al. Gait modification strategies for altering medial knee joint load: a systematic review. Arthritis Care Res 2011;63(3):405-426. Shull PB, Silder A, Shultz R, et al. Six-week gait retraining program reduces knee adduction moment, reduces pain, and improves function for individuals with medial compartment knee osteoarthritis. J Ortho Res 2013;31(7):1020-1025. Schipplein OD, Andriacchi TP. 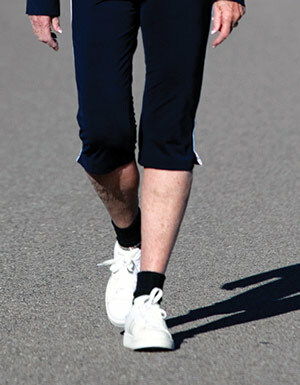 Interaction between active and passive knee stabilizers during level walking. J Orthop Res 1991;9(1):113-119. Ahlbäck S. Osteoarthrosis of the knee. A radiographic investigation. Acta Radiol Diagn 1968;277(Suppl):7-72. Birmingham TB, Hunt MA, Jones IC, et al. Test-retest reliability of the peak knee adduction moment during walking in patients with medial compartment knee osteoarthritis. Arthritis Rheum 2007;57(6):1012-1017. Hurwitz DE, Ryals AB, Case JP, et al. The knee adduction moment during gait in subjects with knee osteoarthritis is more closely correlated with static alignment than radiographic disease severity, toe out angle and pain. J Orthop Res 2002;20(1):101-107. Sharma L, Hurwitz DE, Thonar EJ, et al. Knee adduction moment, serum hyaluronan level, and disease severity in medial tibiofemoral osteoarthritis. Arthritis Rheum 1998;41(7):1233-1240. Miyazaki T, Wada M, Kawahara H, et al. Dynamic load at baseline can predict radiographic disease progression in medial compartment knee osteoarthritis. Ann Rheum Dis 2002;61(7):617-622. Thorp LE, Sumner DR, Wimmer MA, Block JA. Relationship between pain and medial knee joint loading in mild radiographic knee osteoarthritis. Arthritis Rheum 2007;57(7):1254-1260. Shull PB, Lurie K, Cutkosky MR, Besier T. Training multi-parameter gaits to reduce the knee adduction moment with data-driven models and haptic feedback. J Biomech 2011;44(8):1605-1609.
van den Noort JC, Schaffers I, Snijders J, Harlaar J. The effectiveness of voluntary modifications of gait pattern to reduce the knee adduction moment. Hum Mov Sci 2013;32(3):412-424. Shull PB, Shultz R, Silder A, et al. Toe-in gait reduces the first peak knee adduction moment in patients with medial compartment knee osteoarthritis. J Biomech 2013;46(1):122-128. Andrews M, Noyes FR, Hewett TE, Andriacchi TP. Lower limb alignment and foot angle are related to stance phase knee adduction in normal subjects: A critical analysis of the reliability of gait analysis data. J Orthop Res 1996;14(2):289-295. Guo M, Axe MJ, Manal K. The influence of foot progression angle on the knee adduction moment during walking and stair climbing in pain free individuals with knee osteoarthritis. Gait Posture 2007;26(3):436-441. Lynn SK, Costigan PA. Effect of foot rotation on knee kinetics and hamstring activation in older adults with and without signs of knee osteoarthritis. Clin Biomech 2008;23(6):779-786. Hunt MA, Birmingham TB, Bryant D, et al. Lateral trunk lean explains variation in dynamic knee joint load in patients with medial compartment knee osteoarthritis. Osteoarthritis Cartilage 2008;16(5):591-599. Hunt MA, Wrigley TV, Hinman RS, Bennell KL. Individuals with severe knee osteoarthritis (OA) exhibit altered proximal walking mechanics compared with individuals with less severe OA and those without knee pain. Arthritis Care Res 2010;62(10):1426-1432. Mündermann A, Asay JL, Mündermann L, Andriacchi TP. Implications of increased medio-lateral trunk sway for ambulatory mechanics. J Biomech 2008;41(1):165-170. Hunt MA, Simic M, Hinman RS, et al. Feasibility of a gait retraining strategy for reducing knee joint loading: Increased trunk lean guided by real-time biofeedback. J Biomech 2011;44(5):943-947. Fregly BJ, Reinbolt JA, Rooney KL, et al. Design of patient-specific gait modifications for knee osteoarthritis rehabilitation. IEEE Trans Biomed Eng 2007;54(9):1687-1695. Walter JP, D’Lima DD, Colwell CW Jr, Fregly BJ. Decreased knee adduction moment does not guarantee decreased medial contact force during gait. J Orthop Res 2010;28(10):1348-1354. Wheeler JW, Shull PB, Besier TF. Real-time knee adduction moment feedback for gait retraining through visual and tactile displays. J Biomech Eng 2011;133(4):041007. Zhang W, Robertson J, Jones AC, et al. The placebo effect and its determinants in osteoarthritis: meta-analysis of randomized controlled trials. Ann Rheum Dis 2008:67(12):1716-1723.